A Bath city break is a chance to relax in its famous hot springs, take in elegant Georgian architecture and dine in gourmet restaurants. Book a Bath hotel and explore the jewel of south-west England. Ambling around this ornate Georgian city in the day, you'd be forgiven for thinking the nightlife will be sleepy and quiet. But hidden among the genteel townhouses, terraces, and winding streets, you’ll discover a thriving nightlife suited to all tastes. There are bouncing clubs and buzzing pubs, as well as arthouse cinemas and theatres to while away the evenings in. Bath isn’t just about genteel Georgian charm and trendy shopping. It also boasts plenty of attractions for the whole family, whether your kids love messing around in futuristic play parks, exploring wide open green spaces, or being treated to some thrilling theatrical entertainment. Bath has always showcased a strong love for the arts, evident in its many galleries which range from sumptuous international collections to tiny independent stores. The city itself can feel like an open air museum – much of it is a World Heritage Site thanks to its rich Roman history and gorgeous Georgian architecture. From original Roman Baths and a towering abbey, to Georgian streets and expansive parks, Bath is commonly referenced as one of the most beautiful cities in Britain. Whether you’re after a relaxing spa holiday with opulent 5-star facilities, or a city break in an elegant and central location, Bath has a range of different areas and hotels that will easily cater for your needs. From quirky independent boutiques and weekly markets, to high street brands and luxury retailers, Bath is a shopper’s city with something to cater to every style and occasion. With a range of different areas each specialising in their own special niche, you can meander through the city dropping in wherever takes your fancy; whether it's rifling through the market stalls or pounding the pavement of the busy high street. With elegant Georgian architecture giving way on to pleasant green expanses and a gently burbling river, Bath is a quiet, peaceful, and attractive place to spend a city break. 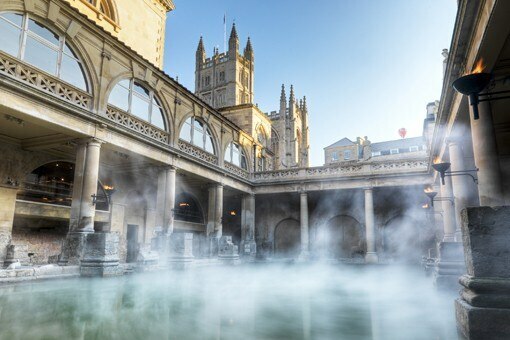 Bath's name stems from the way Ancient Romans used to bask in the city’s unique thermal waters over 2,000 years ago. Today you can discover a diverse range of historic attractions, not to mention tempting restaurants and quaint pubs whenever you need to refuel. As a World Heritage Site with a thriving tourist industry, Bath has an array of eateries to cater for the legions of visitors it receives each year. From gastropubs in terracotta Victorian buildings, to up-market restaurants in 18th century townhouses, the food is as elegant as the surroundings. Bath also has gourmet vegetarian restaurants, and a whole host of chic pubs and wine bars where you can carry the night on in style. Holidays in the Cotswolds take in limestone villages, classic English manor houses and hillside gardens. Cotswold hotels place you at the heart of the rural life that makes the region a magnet for outdoor types.